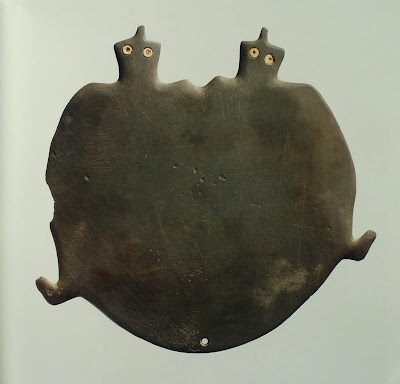 Palette in the shape of a pair of turtles, ca. 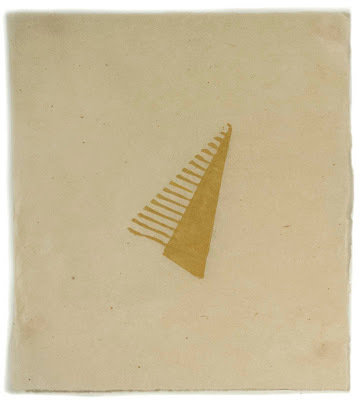 3650-3300 BC; graywacke, 6 x 6 5/16 in. The artists of Egyptian antiquity had a marvelous sensitivity when it came to picturing animals. 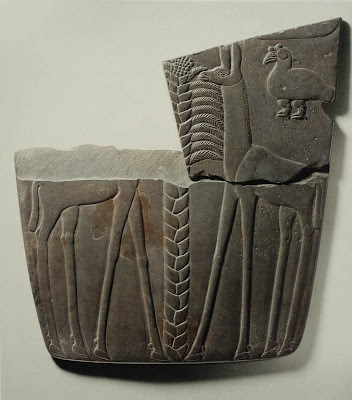 I've always been moved by the birds and cattle and wildlife in low relief carvings (you can see a couple of examples in this blog post), but I'd been mostly unaware of the sculpture that came before the Dynastic Age, before the Pharaohs. The Metropolitan Museum of Art mounted an enlightening show which I was lucky enough to see this spring, titled The Dawn of Egyptian Art; it's on view until this Sunday, August 5th. I just treated myself to the catalog, and photographed these images from it. Although there were human figures in the sculpture on view, it was the animal carving that completely delighted me. Can anyone fail to be enchanted by the pair of turtles with their surprised eyes and small feet projecting from the large simple curve? 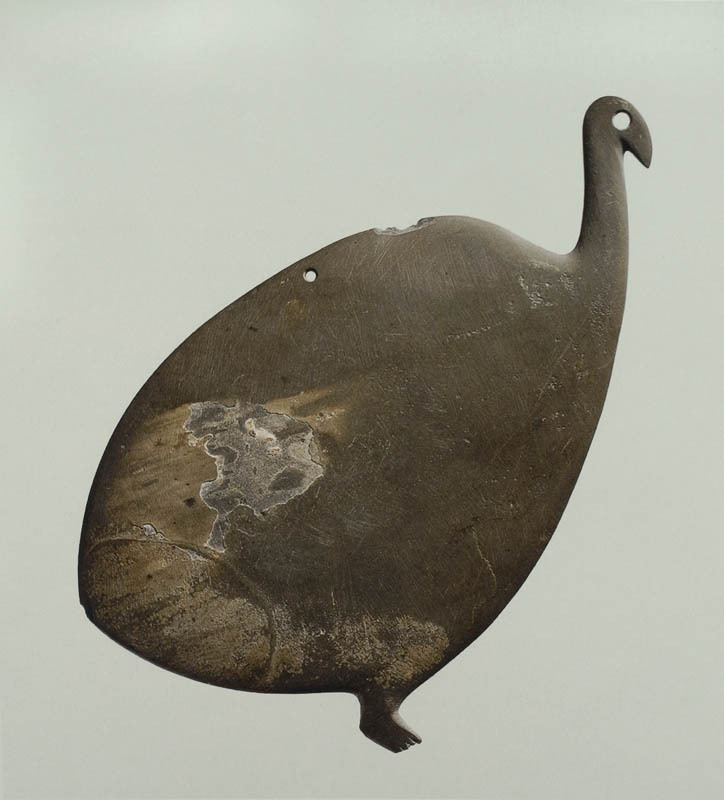 Guinea fowl-shaped palette, ca. 3650-3300 BC; graywacke, 7 5/8 x 5 13/16 in. The early Egyptians lived in small villages along the Nile, with their burial sites, in which these objects were found, on higher land. Palettes were used to grind minerals into paint for outlining the eyes. Some of the palettes were used before being placed in tombs, but others were not. The form of these pieces seems so modern, as though they were sculpted by a 20th century artist. The shapes are satisfying, and also tender, and amusing. Cow's head with horns, ca. 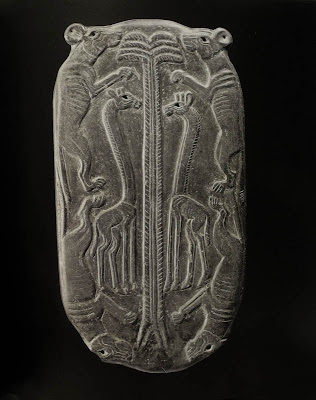 3650-3300 BC; graywacke, 3 16/16 in. Picasso? 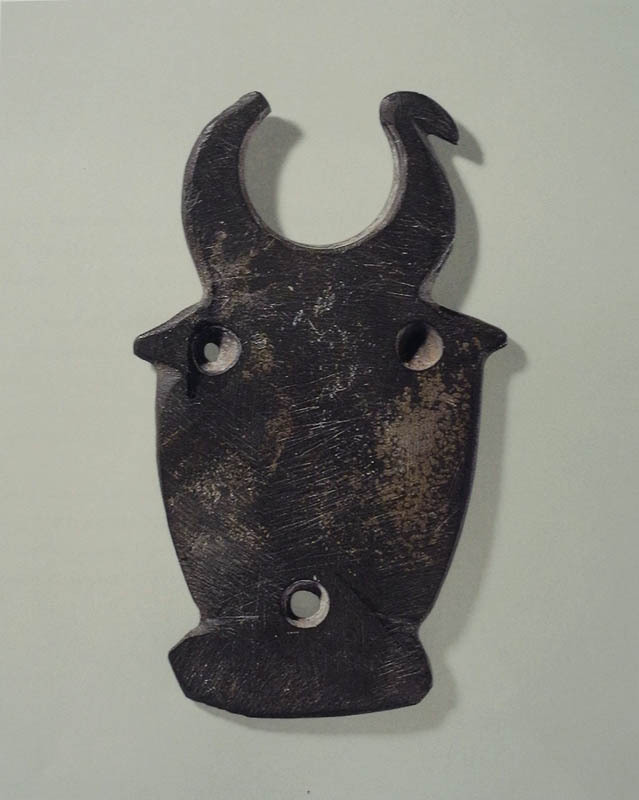 this is close to the simplicity of Picasso's bull's head made with a bicycle seat (with holes in it) and handlebar. Elephant-shaped palette, ca. 3650-3300 BC; graywacke, 8 1/4 x 5 1/2 in. During the Predynastic period there were sufficient rains to encourage a wide range of wildlife along the Nile and up into the lower desert and the Eastern and Western deserts. There were elephants in Egypt during this early period––they were found in elite burial sites in Upper Egypt, Hierakonpolis––but when the climate became drier during the time of the Pharoahs, they moved south. 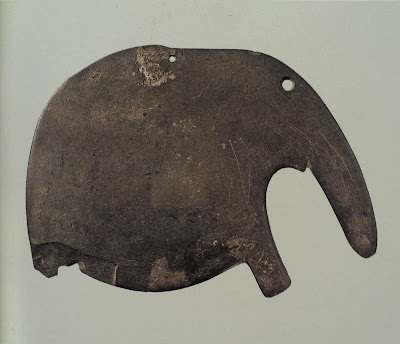 Amulet in the shape of an elephant's head, ca. 3650-3300 BC; ivory, blue frit; 1 7/8 in. This piece is startling in the clarity of its curved lines and round eyes. 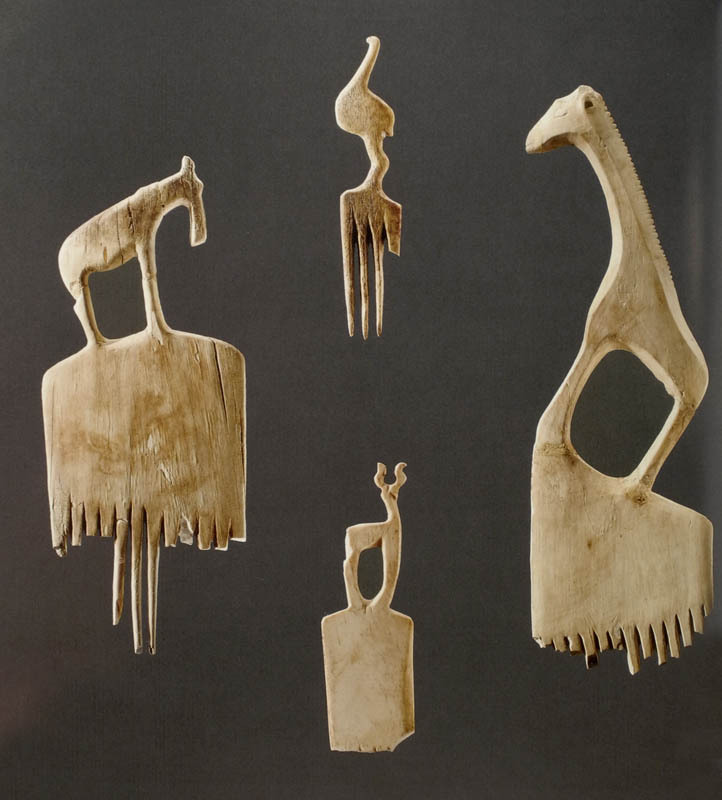 Hair combs with ostrich, giraffe, antelope, wildebeest, ca. 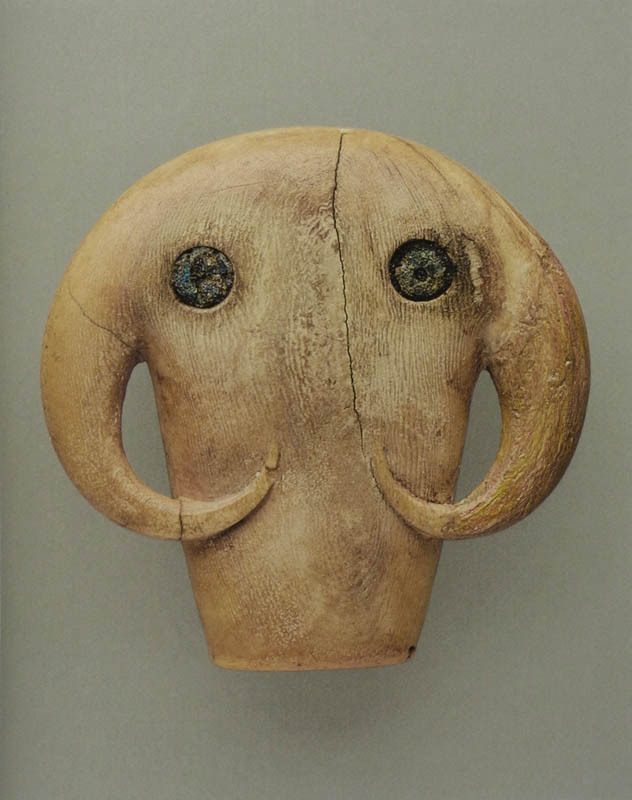 3700-3300 BC; bone or elephant ivory; heights from 3-7 1/2 in. These beautiful hair combs, surmounted by animals of the desert, were probably worn by women at a special event. I like how each of the animals appears to be standing on a small hill, integrating the shape of the animal with the curve of the comb. 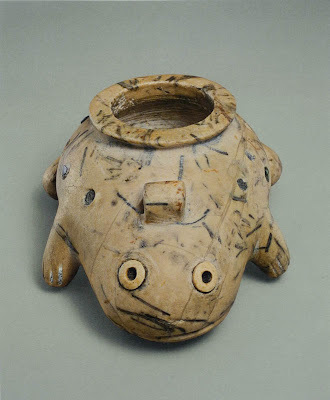 Frog shaped jar, ca. 3400-3300 BC; limestone inlaid with shell, lapis lazuli, and turquoise; 3 5/8 in. Frogs were plentiful along the river; as the yearly flooding receded, many young frogs were seen in the mud, so they became a symbol of fertility and rebirth. It is therefore assumed that frog shaped jars contained a substance used at childbirth. This is another charming creature. 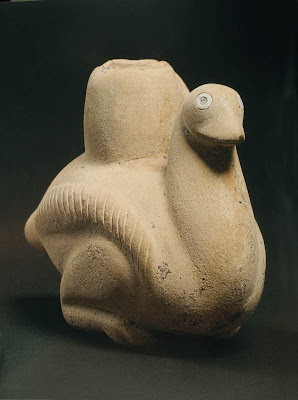 Jar in the shape of a squatting bird, ca. 3300-2900 BC; limestone inlaid with shell, 3 3/4 x 4 7/8 in. 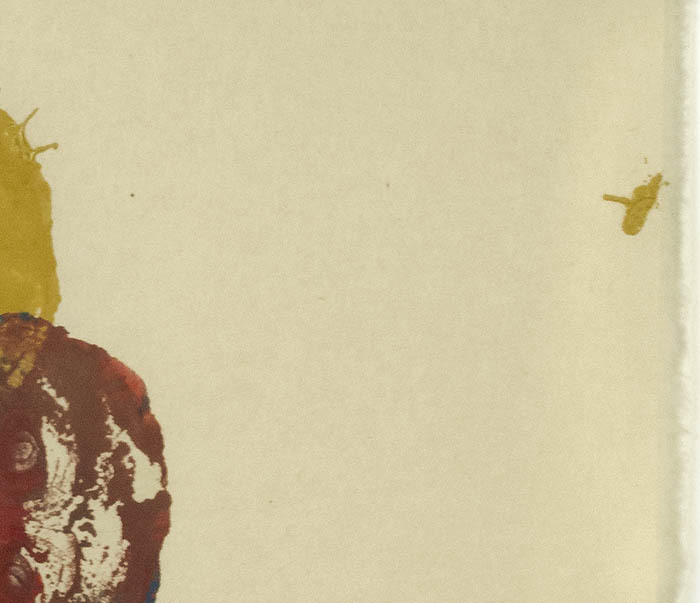 In a show full of lively and amusing depictions of animals, this little bird might be my favorite. It is probably a duck, perhaps sitting on a nest. The tilt of the head with its inlaid eyes give the bird such a bright presence that it seems it could get up and fly, or at least waddle away. 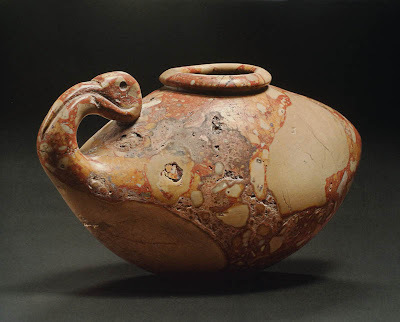 Ibis-shaped vessel, ca. 3300-2900 BC; red limestone breccia; height 5 1/8 in. The ibis is a more formal bird, carved in a complexly patterned stone, the body of the jar echoing the shape of its body. 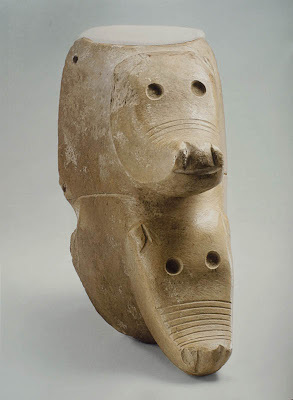 Jar in the shape of mating hippopotami, ca. 3650-3300 BC; limestone; 5 x 2 1/2 in. 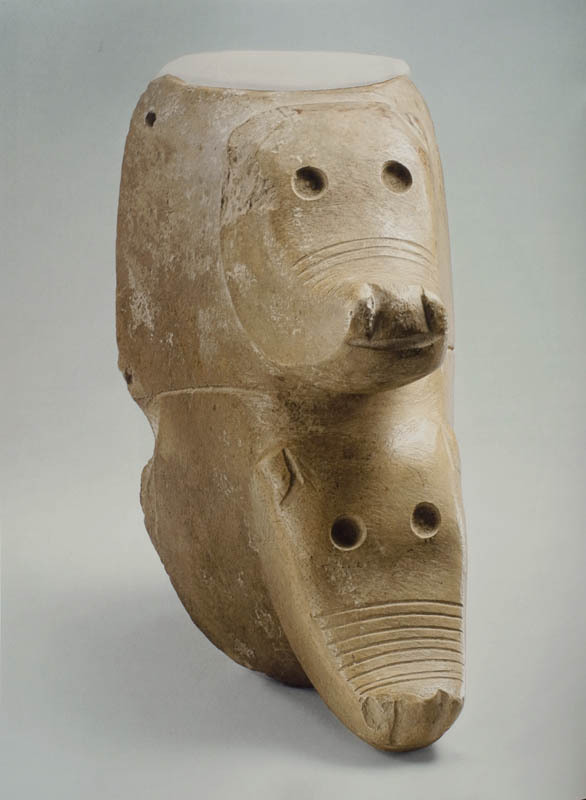 I love the stylized heads of these two hippos, one raised, one lowered, with lines across their snouts. The catalog informs me that the mating and reproduction of animals was very important to the ancient Egyptians, so it's not surprising to see an image like this. The first image above, of the dual turtles, may also be a mating pair. Ceremonial Palette (The Four Dog Palette), reverse, ca. 3300-3100 BC; graywacke, 12 5/8 x 6 3/4 in. A few hundred years later, in the Early Dynastic period, the sculpture becomes more sophisticated, closer to what we think of as typical Egyptian art. There were ceremonial palettes in the show that were just spectacular (as always, you can click the image to see it larger). Elegantly detailed, with refined and flowing lines, these pieces were transfixing. 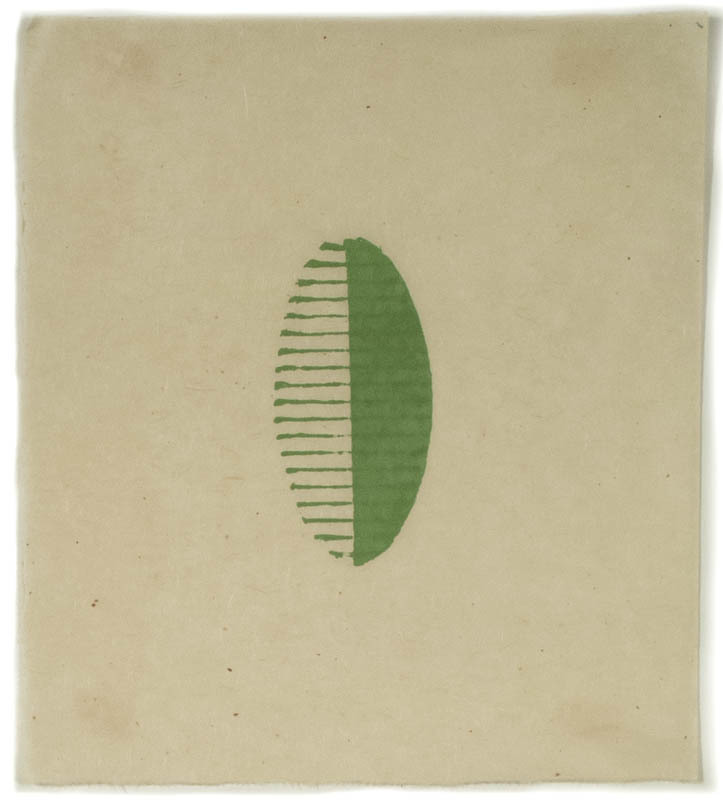 Ceremonial Palette (The Battlefield Palette), reverse, ca. 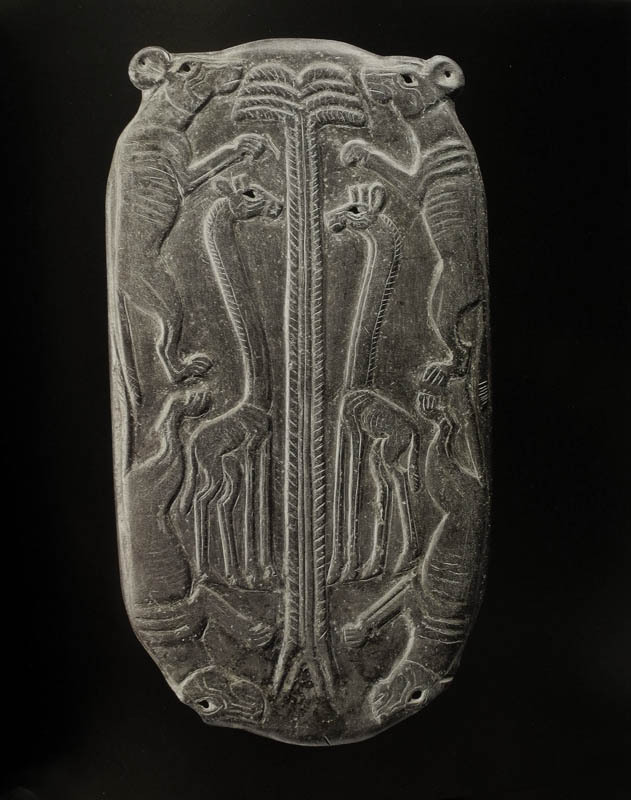 3300-3100 BC; graywacke, 12 5/8 x 11 5/8 in. Both palettes I've illustrated have a central palm tree flanked by animals. I'm always amazed at how much volume and living presence Egyptian sculptors were able to show with such delicate low relief. Like the earlier work above, so much seems to depend on a sensitive, felt line, which has its beginnings in the outlines of the simple forms of gray palettes. 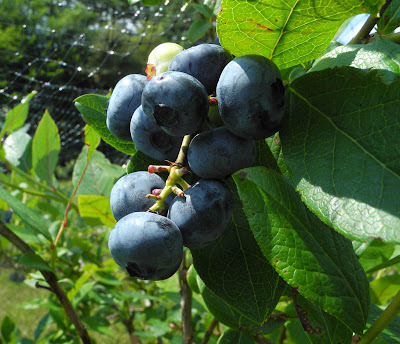 It is blueberry season, and time to think of muffins and pies, jam and tarts. 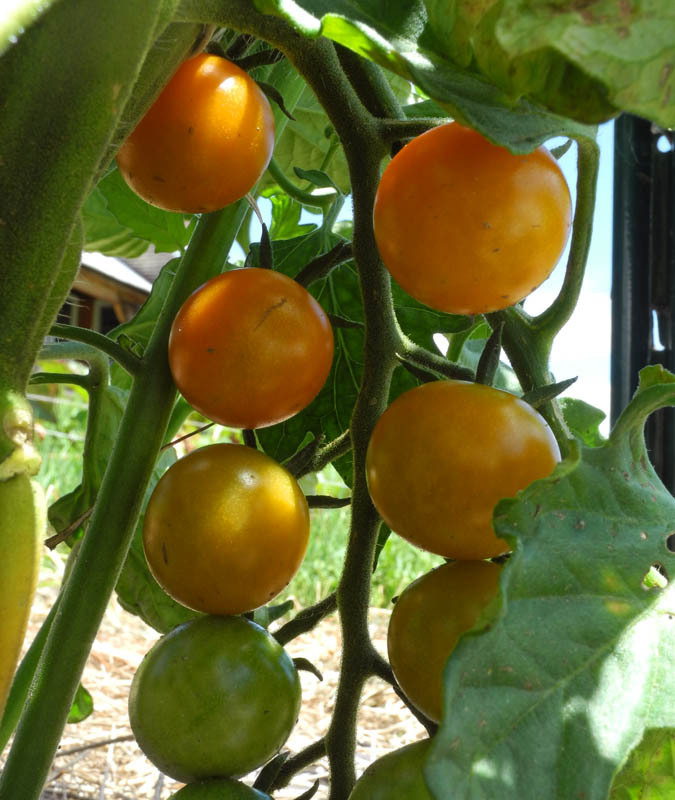 It's so nice to know that these delicious little globes are very healthy to eat. 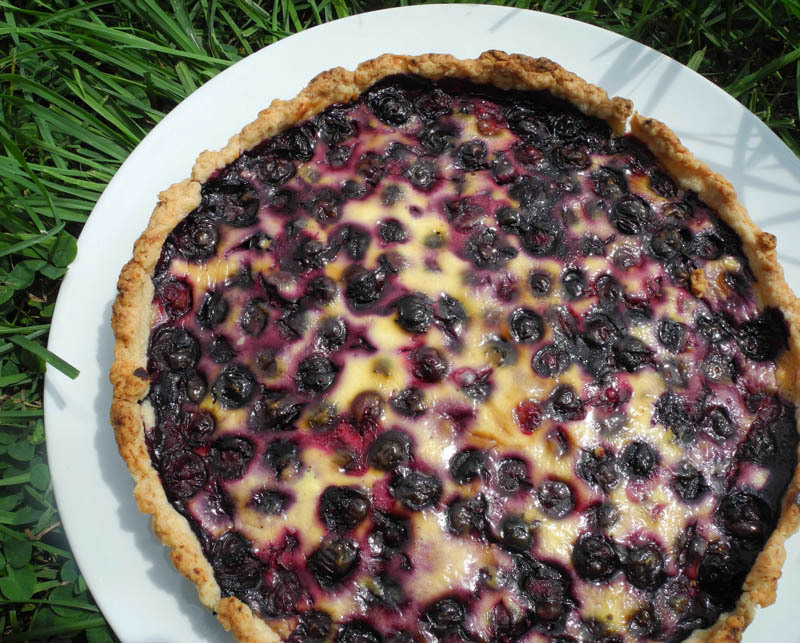 A favorite blueberry dessert is a tart from Deborah Madison's Vegetarian Cooking for Everyone. It is very rich, but not overly sweet, using only 3 tablespoons of molasses, so the taste of the berries stands out. You first pre-bake a buttery shell, then line it with berries and add the custard, made with sour cream. Stir flour, salt and sugar together in a bowl, then work in the butter using two knives, your fingers, or a dough cutter until it is in fine crumbs. Mix in enough vanilla water for the dough to pull together. Wrap in plastic wrap and put in the refrigerator for 15 minutes. Roll the dough into a 9 inch circle and set in pan. Using the hell of your palm, press the dough up the sides. Move longer pieces as needed to fill thin areas. The sides should be thinner at the bottom and rise slightly above the pan, which helps for shrinkage when it's baked. Place tart shell in the freezer to harden. Preheat oven to 400º. Put frozen shell on a sheet pan and bake until set and starting to color, about 10 minutes. Prick any large bubbles that occur while baking with the tip of a knife. Toss berries with the flour, molasses, and lemon zest and arrange them loosely over the bottom of the pre-baked shell. Mix the remaining ingredients together and pour over berries. Preheat oven to 425º. Bake until custard is browned and puffed, about 35 minutes. Let cool before serving to grateful guests, or to yourself and your family! A New Cardboard Print: "Four Shapes"
Four Shapes, ink on Gampi smooth paper, from cardboard plates; ed. 5; 4 pieces, paper size each 14 x 12 1/2 in., image size variable, ca. 3-5 x 6 in. 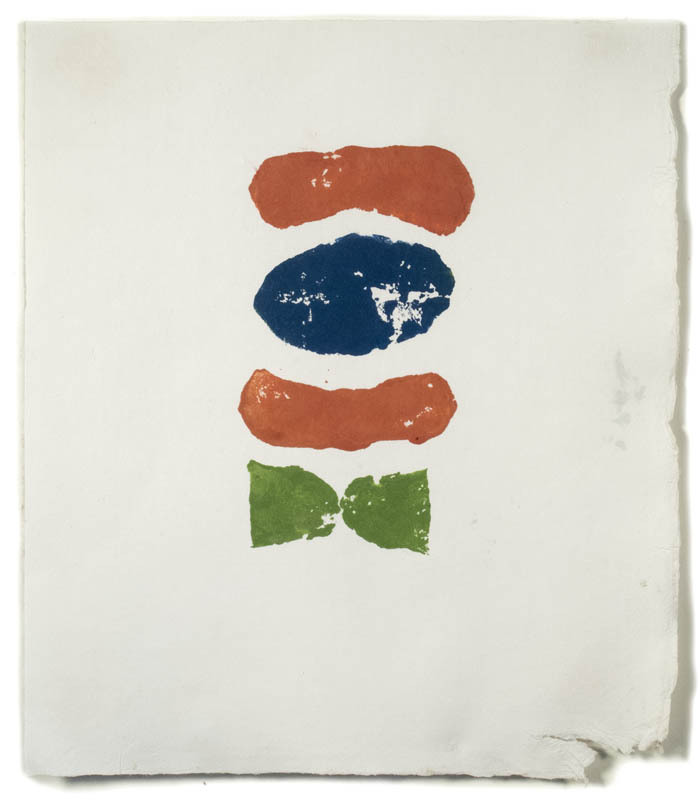 Four simple shapes, four colors, on four sheets; three shapes tilting, and one, a vertical oval, standing stalwart. 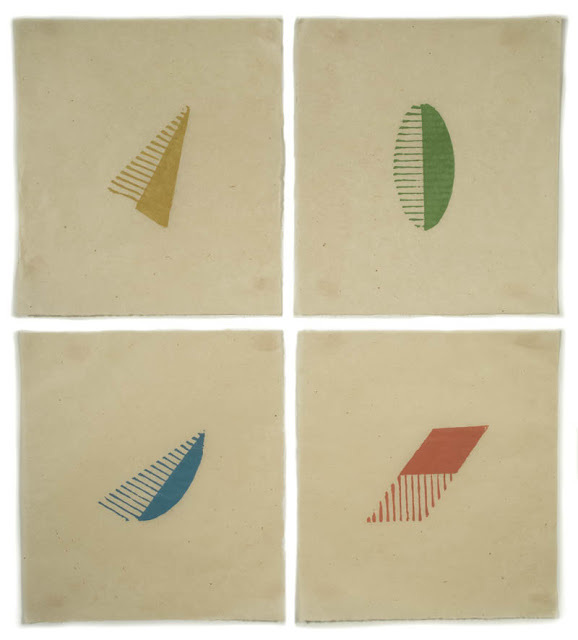 Blinky Palermo, 4 Prototypes (4 Prototypen), 1970; portfolio of 4 screenprints, sheet each 23 5/8 x 23 5/8 in. The inspiration for this work came from the first work I'd seen by Blinky Palermo (images here; my blog post on textiles of mine he inspired here). 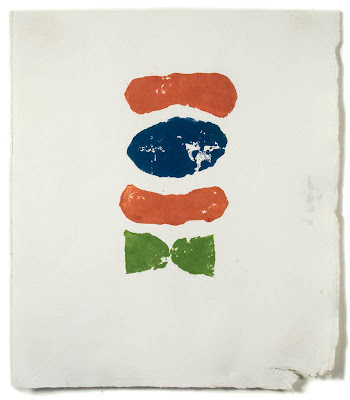 I saw them in the mid to late 80s on 57th St., a set of prints that stopped me in my tracks. 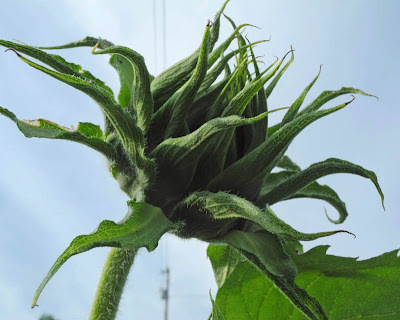 I loved their offhandedness, the classic forms made irregular. He's an artist I think about a lot; I even named my male cat Blinky in his honor. Above are details of the four shapes individually, though I see each of the four as part of one piece. I think I would frame each sheet individually and have the four abut each other, rather than framing them together in a single frame, which is how the Palermo work was shown. They are individuals, yet part of a whole. 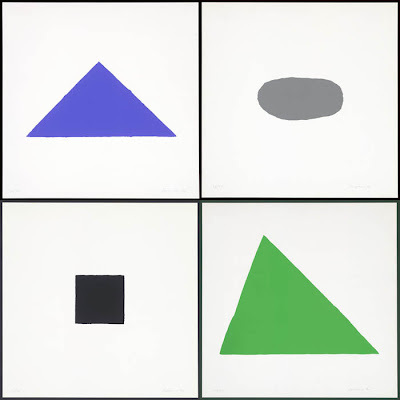 This is the palette with the four colors for Four Shapes. I began by mixing the green for the oval shape, warming the cool green ink with lots of yellow and some red, with white to lighten it. 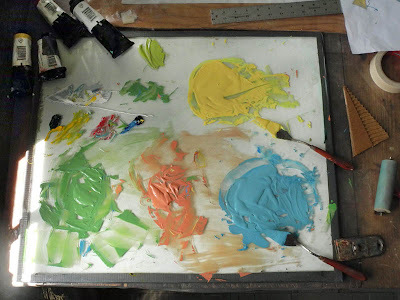 When I mixed the remaining colors, I added some of the green to each of them, red to the blue and yellow, etc. 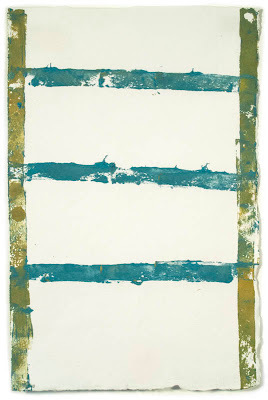 In this way, I moved the colors away from their primary expression to something more harmonious, yet still lively. I'm happy with this work; it makes me smile. A very early Pruden's Purple, the only one showing red. 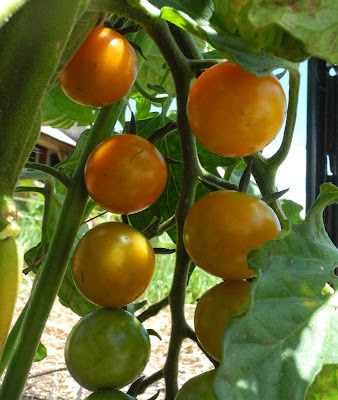 Is there anything more thrilling for a northern gardener such as myself than seeing tomatoes beginning to ripen? 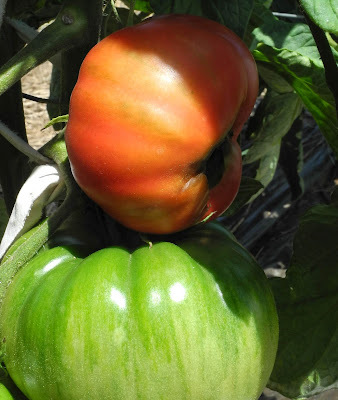 It's not that I don't love you Corn, or Beans, or certainly Eggplant (I adore eggplant), but the fresh, juicy Tomato is the embodiment of summer; sweet and tart, creamy smooth, each variety with its own pleasures. Mmmm: thick slices of tomato with just a little bit of coarse salt, tomato sandwiches on homemade challah, fresh uncooked tomato sauce; or, just standing in the garden, biting in, juice dripping down my chin; or, popping those small rounds of deliciousness, the apricot-colored Sungolds, into my mouth, one after another. Ladder, ink on Masa dosa paper, 12 x 8 in. 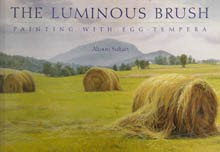 Through my entire artistic life my work has depended on a great deal of planning and control; my paintings, textiles, and cardboard prints are worked up from precise drawings with a clear objective in mind. 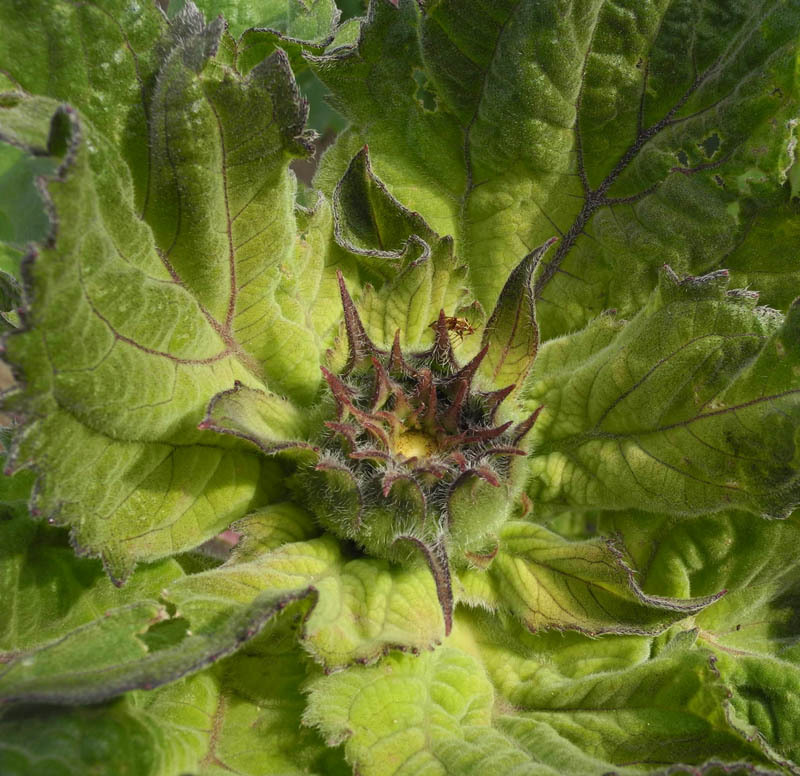 This is not to say that there is no surprise during the process; there always is, in dyeing wool, in mixing paint, in using the brush or the baren. 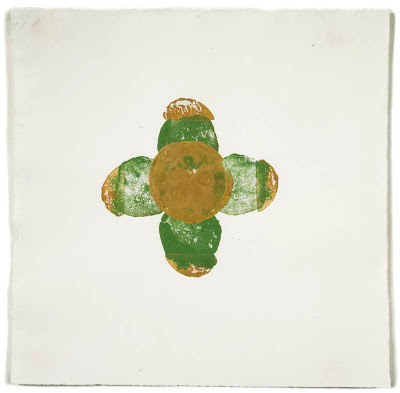 However, I've never worked in such an improvisatory way as with this suite of potato prints. 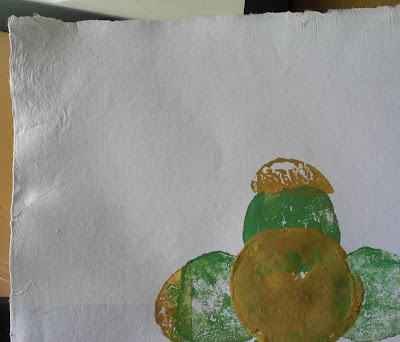 I cut the potatoes into shapes without a preplanned drawing, dip them into ink, stamp them on the paper without any preconceived ideas at all; I stand above the blank paper, wielding shapes, and the composition builds bit by bit as I stamp. 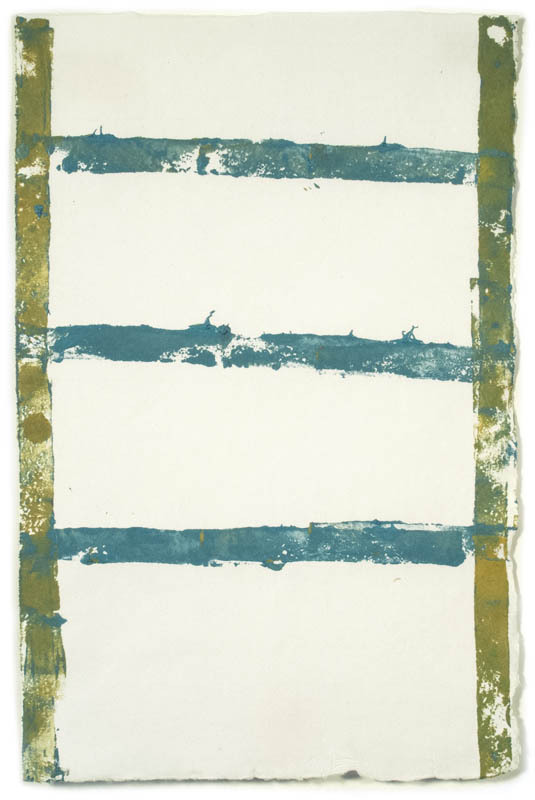 In the case of Ladder, I had cut a long thin rectangle, dipped it in two different colors, linking up the shapes to make long lines. The green edges came first, then the bluish horizontals, neither planned; they just seemed a good idea at the time. Primary Circles, ink on Nishinouchi paper, 12 x 11 in. Some of the images seem terribly mundane to me, like this linking of three circles which have other irregular circles within them (this print was made with an onion, not a potato). So I think "dumb idea" to myself, but then am intrigued by the accidental quality of the stamped ink, the areas that aren't covered, the thicker lines, the splashes. Even an unwanted splash of yellow which first seemed to mar the piece now seems to me to be integral to it. Another dumb idea? ; I honestly don't know. Descending Ovals, ink on Gampi smooth paper, 18 1/2 x 11 1/2 in. 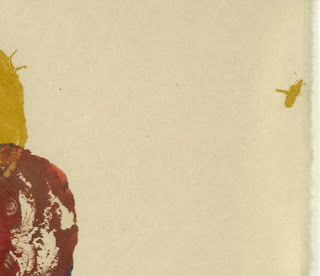 A similar change of thought happened with this piece as I decided to leave the splotches of ink at the bottom of the sheet instead of tearing it down to remove them. As I do more of these, many will be placed on the reject pile. This one is sure to go there because when I double stamped the top shape, the ink became too opaque for the feeling I wanted. Bow Tie, ink on Masa dosa paper, 12 x 10 3/4 in. An amusing portrait perhaps? Another accident I let be: the poorly finished edge of this sheet of hand made paper. I also like how each stamp of the same shape appears different: the ink misses different spots each time, is more or less opaque. This is something I can't control, and I don't want to. 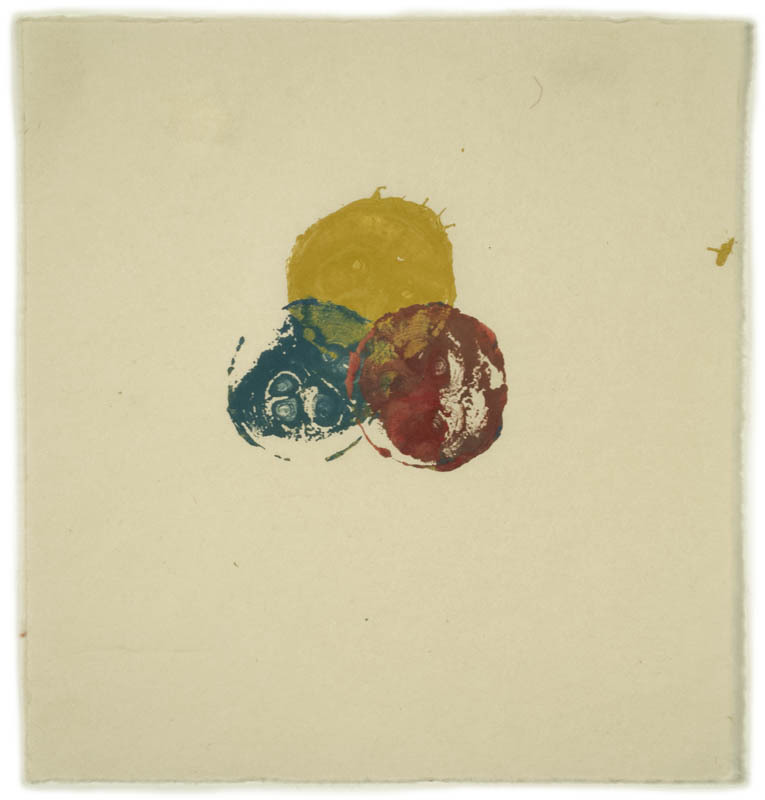 Gold Caps, ink on Masa dosa paper, 12 x 12 in. 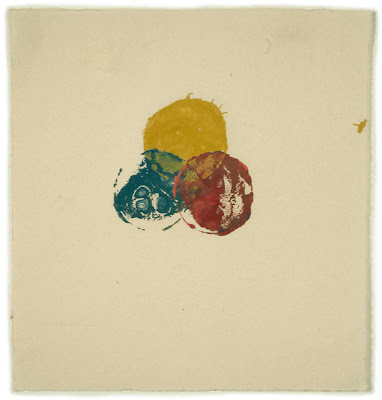 Another centered composition, with the gold circle made by an onion's stamp. 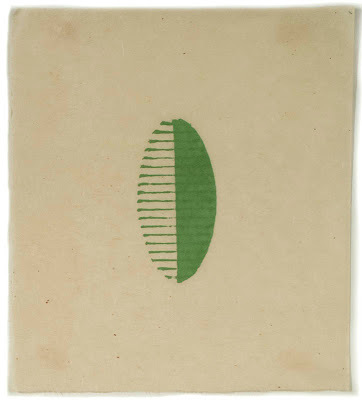 Green Band, ink on Nishinouchi paper, 9 x 6 1/2 in. 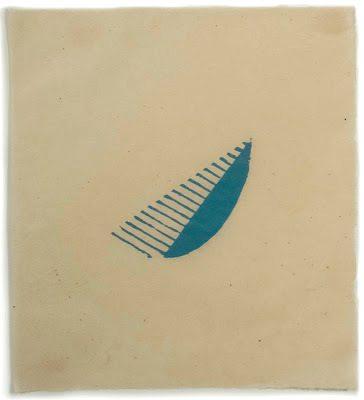 Two Blue Ovals, ink on Akatosashi paper, 4 1/2 x 11 1/4 in. The two pieces above use the same shape, a long rectangle with shapes cut out of it, which did interesting things put end to end. I used it for a long, large piece that I recognized as a total failure right away. With each session I've had one or two pieces that went right into the trash, so at least I have some little idea, vague but still hovering, of what I'm trying to achieve with these works. 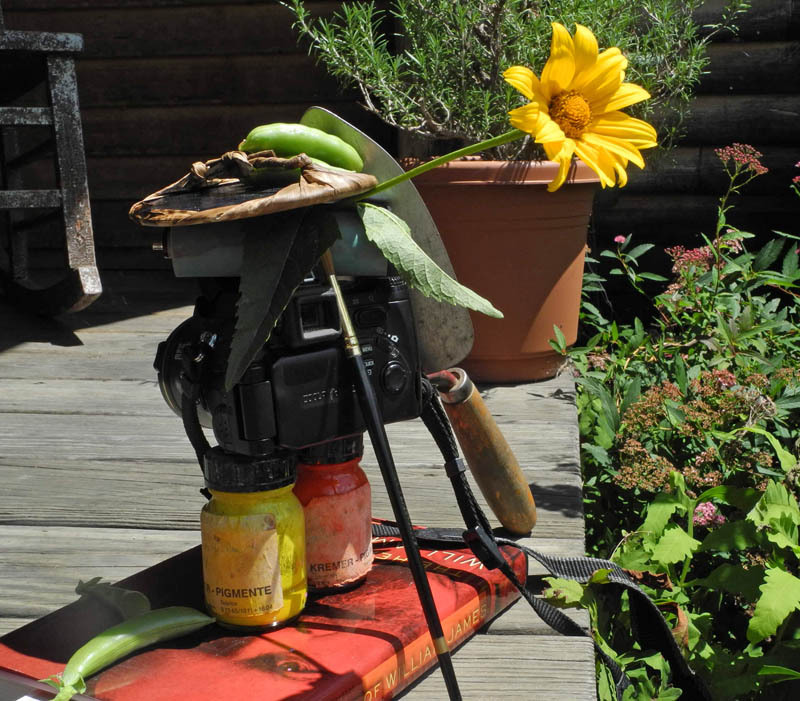 I am attracted to the notion of chance and improvisation; I'm just not sure it's my forte. 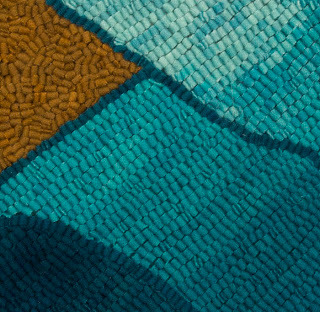 Here's a detail of one of the prints shot with a side raking light so you can get some idea of the texture of the Masa dosa paper; I love its irregular edges and surface. Using these beautiful Japanese papers is one of the reasons I'm enjoying my foray into printmaking. 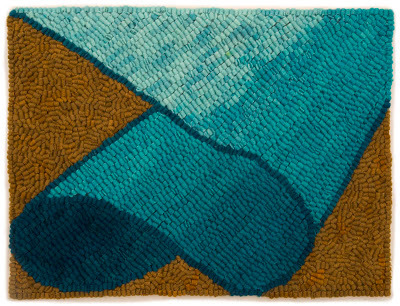 The sensuous appeal of materials––the silky smoothness of calfskin parchment, the fuzzy weight of wool, the surfaces of paper––has become an important factor for me in my work. 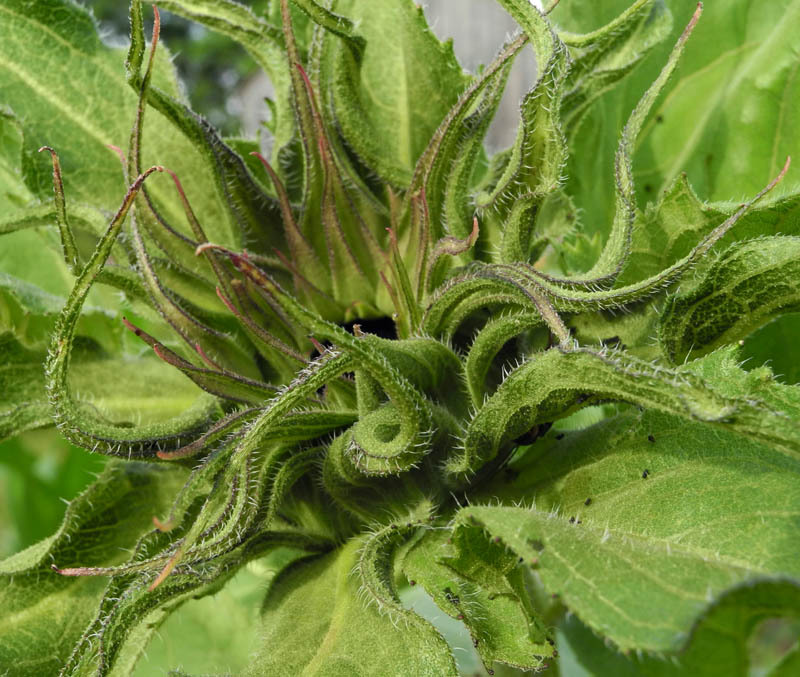 How is it that I've never before noticed the extravagant movement of the sepals protecting the emerging sunflower? 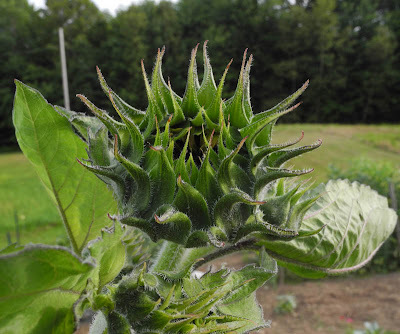 This summer I'm trying a couple of new varieties, Lemon Queen and Red Sun, so perhaps my long-favored plant, Holiday, which I'm not growing this summer, has more sedate flower parts. The spiky sepals look as though they are swaying to underwater ocean currents; I can imagine this as a new type of sea anemone. The purplish sepals make a small package nestled in the large ruffled leaves. 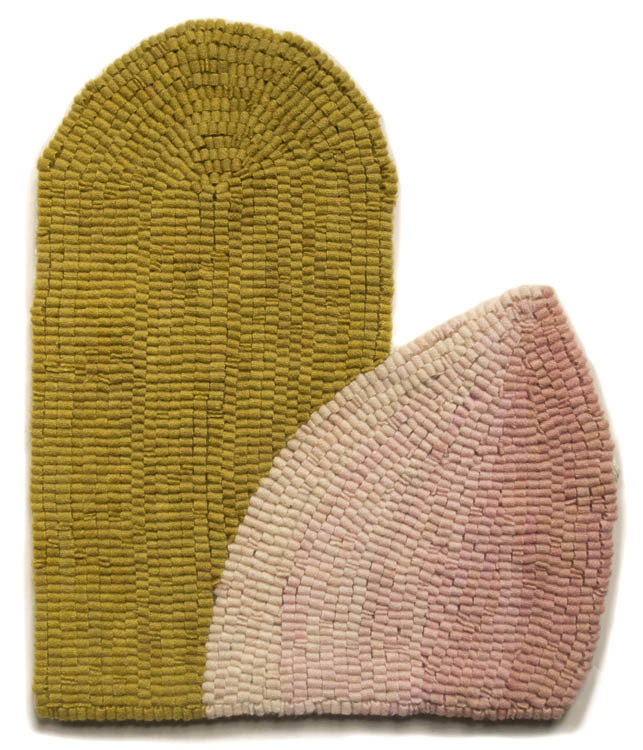 From a sea creature to a desert cactus, these pointed green spikes take on different characters, remind me of different climates and environments. As they spread apart, the sepals allow a Red Sun sunflower to unfold its petals, opening a special gift. 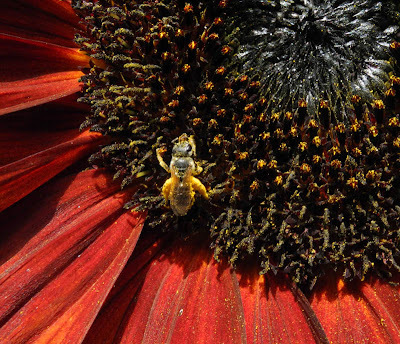 And the flowers are a gift indeed, to the eye and to the bees which busily gather their pollen. 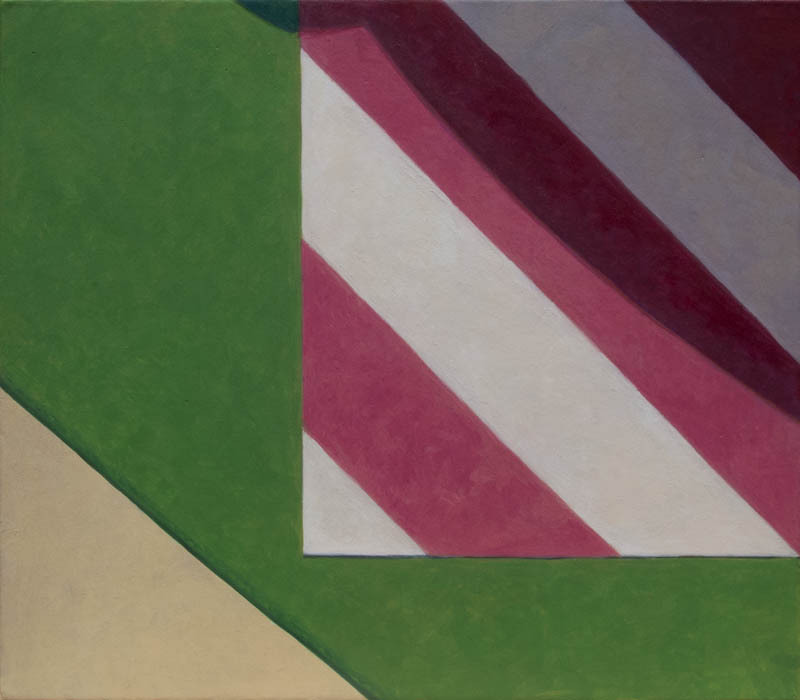 A New Painting: "Candy Stripes"
Candy Stripes, egg tempera on calfskin parchment, 7 x 8 in. 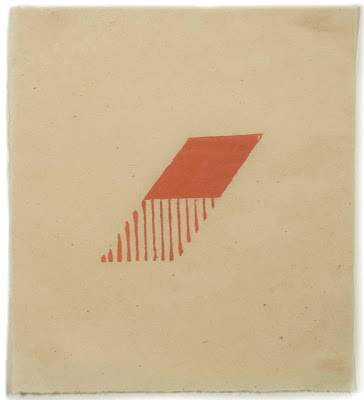 I felt almost rebellious making this minimal, silly-colored painting. 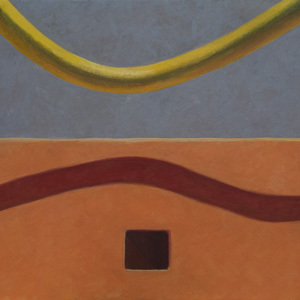 After my near meltdown following my last painting, which you can read about in this blog post, this flat simple work was like an antidote to my confusion. Setting the disliked painting I was working on aside, I went out to take more photographs as studies for paintings. Some of the images I found were a bit more abstract than previous ones; when I put them up for contemplation, they made me happy. I felt that the meltdown had served a useful purpose: it had shaken up my vision. My intention with this painting is that the image should look very flat and abstract, except for hints that keep it in the real world: the shadow line under the green and striped areas, indicating a thin but solid presence; and the shadow crossing the green into the candy stripes, showing a sense of sunlight. 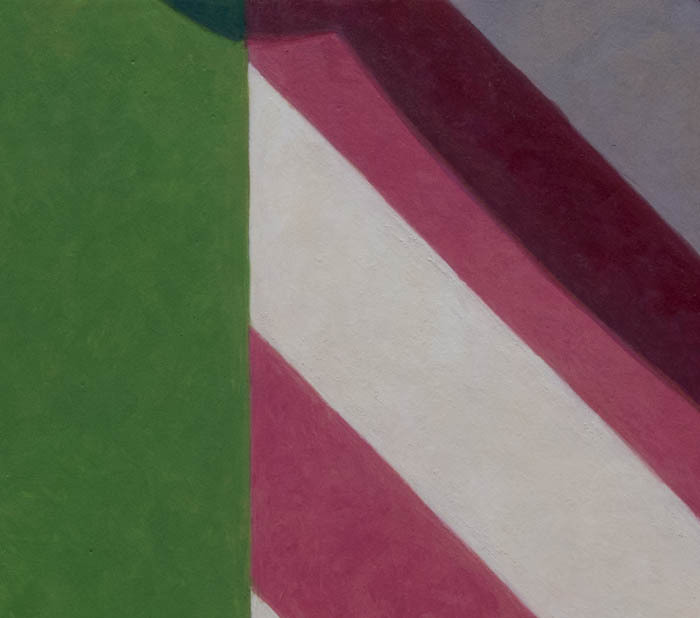 It took a lot of adjustments of color to get the shadow to be convincing, and to have the green and pink and white sit on the same plane (I hope). I also hope the shapes have a palpable presence; to that end I keep a varied brushstroke visible in the paint, with slight color variations. Studio wall with recent paintings. I had thought that Candy Stripes was so quirky that it would look out of place with my other paintings, but it seems to fit in okay. Now I'm back to working on a painting that depicts solid volumes, but working on this flat image was refreshing. 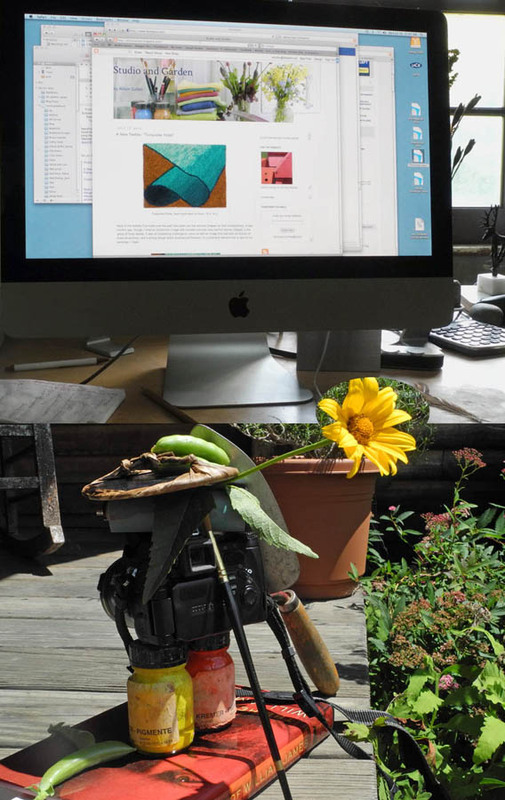 "There is no such thing as work-life balance. Everything worth fighting for unbalances your life." "How one walks through the world, the endless small adjustments of balance, is affected by the shifting weights of beautiful things". Three years ago, when I lost my New York City gallery, my life seemed as though it had a new large empty space with nothing to fill it. How that has changed! Now I feel that there's not enough time in a day, and not enough energy, to do all that I'd like to accomplish. It's especially difficult during summer, when there's the garden to attend to, the lawn to mow, and much more socializing than in winter. The serious reading I used to do is now on the bottom of the pile made up of my various art endeavors: painting, photography, textiles, printmaking, all calling for attention, each of which I love. And then of course, the computer sits atop it all, with my blogging and photography; with Facebook, and reading the news online. Is de Botton correct in saying worthwhile things unbalance your life? 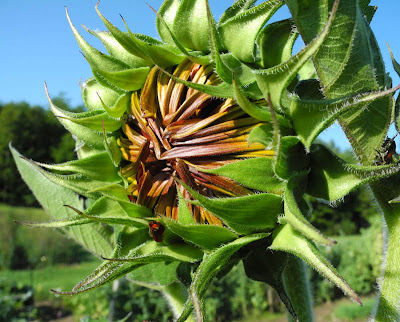 I prefer thinking in a way closer to Scarry; there is a constant shifting, weighing, balancing, of things beautiful and not, but paying attention to beauty can keep us grounded. The most important thing I've realized, and that I am attempting to teach myself, is to choose something to do each day––whether painting, or printmaking, or making dinner for friends––and relax into it; don't spend time worrying about the long list of chores I have to do; do one thing at a time and give it my attention. And don't be concerned if I don't get everything done. Calm, relaxed, accepting. I haven't yet learned the lesson completely (oh, it's so much easier to worry!) but I'm working at it. Do you have a strategy to balance all the things in your life? If while washing the dishes, we think only of the cup of tea that awaits us, thus hurrying to get the dishes out of the way as if they were a nuisance, then we are not "washing the dishes to wash the dishes". What's more, we are not alive during the time we are washing the dishes. In fact we are completely incapable of realizing the miracle of life while standing at the sink. If we can't wash the dishes, the chances are we won't be able to drink our tea either. While drinking the cup of tea, we will only be thinking of other things, barely aware of the cut in our hands. Thus we are sucked away into the future––an we are incapable of actually living one minute of life. 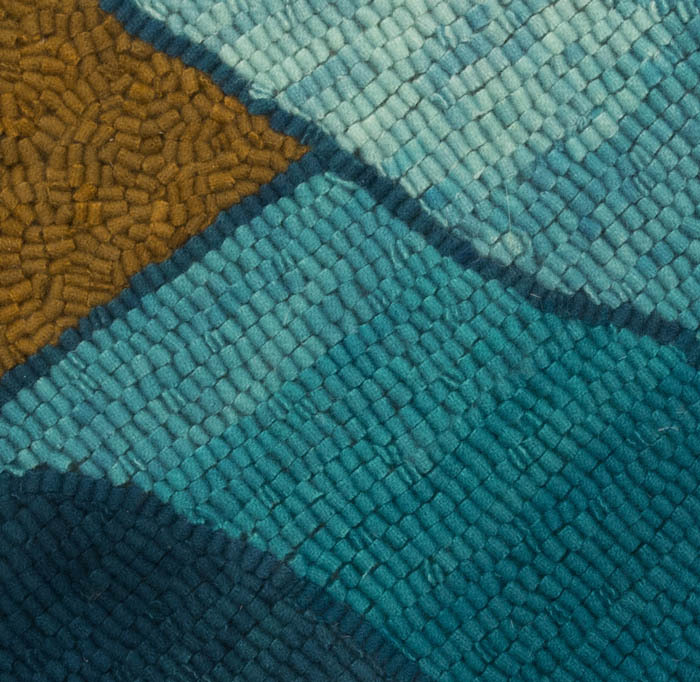 A New Textile: "Turquoise Folds"
Turquoise Folds, hand dyed wool on linen, 10 x 13 in. 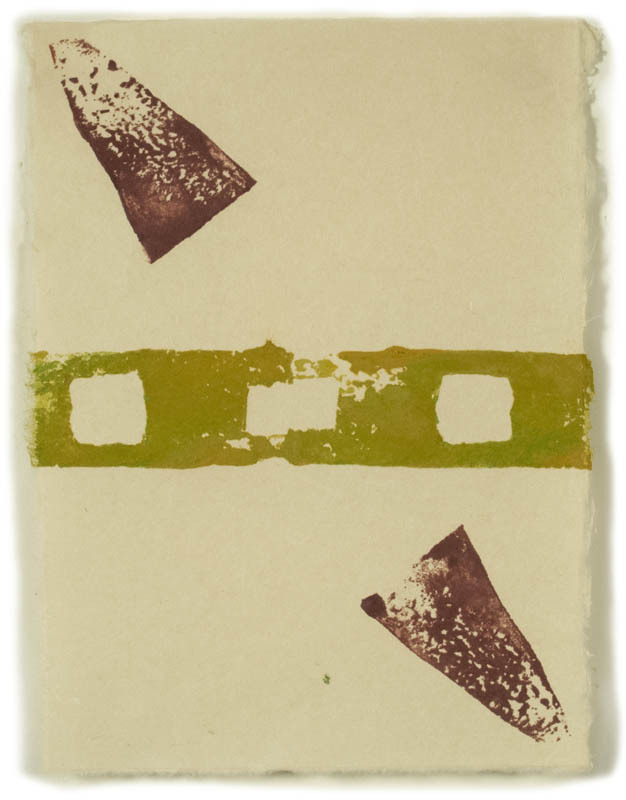 Most of the textiles I've made over the past few years use flat abstract shapes for their compositions. A few months ago, though, I tried an illusionistic image with rounded volumes (see the first textile, Draped, in the group of three below). It was an interesting challenge to come up with an image that had both an illusion of three dimensions, and a strong design which emphasized flatness; it's a both/and element that is also in my paintings, I hope. 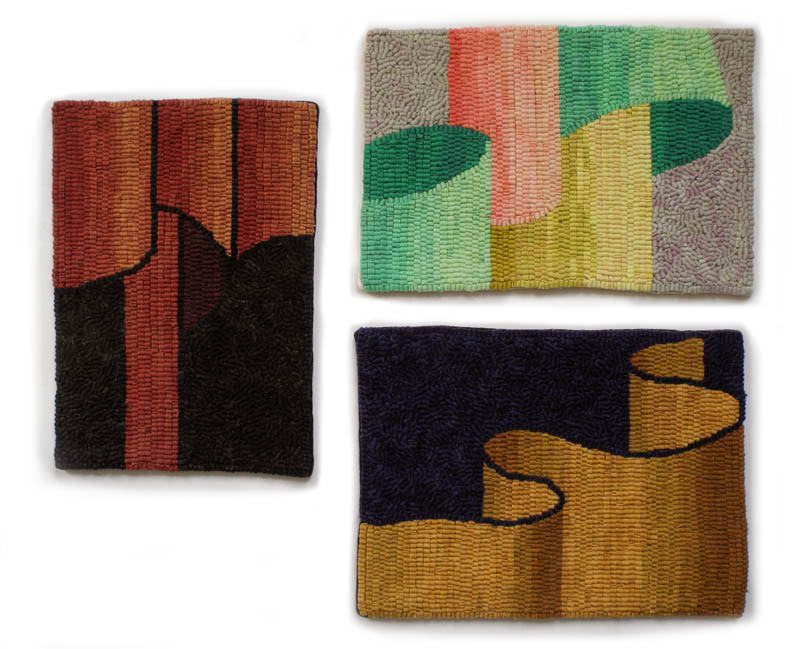 My textiles have influenced my paintings over the past few years, so it's fun to have the influence go the other way. When I completed the previous work in this volume series, Four Cylinders, a couple of people remarked that it reminded them of Renaissance drapery; so, I did several sketches based on those paintings, finally coming up with this, my own design. Of course the Virgin's robe is always an ultramarine blue, so I nodded in that direction with this turquoise. 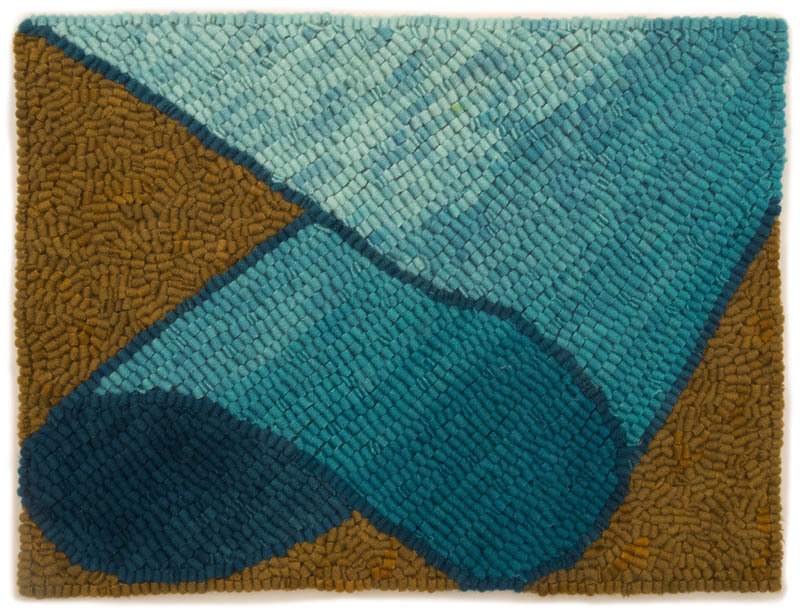 I plan to continue to occasionally add to the series of volumetric images, and to the shaped textiles, such as Arch and Point, which have an illusionistic element in them. 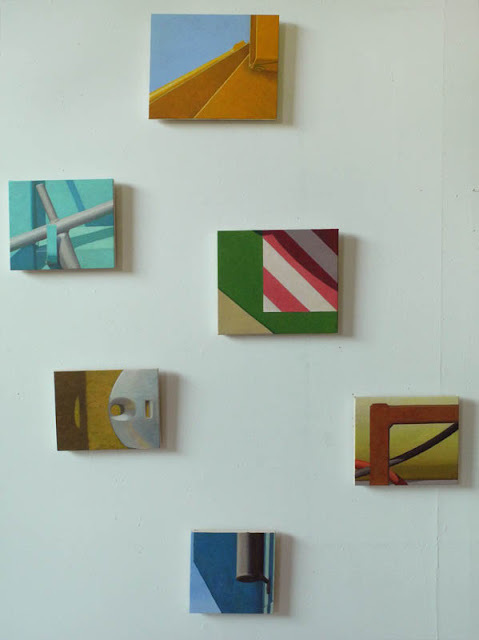 It's a way of bringing my painting and textiles closer together as each body of work develops. 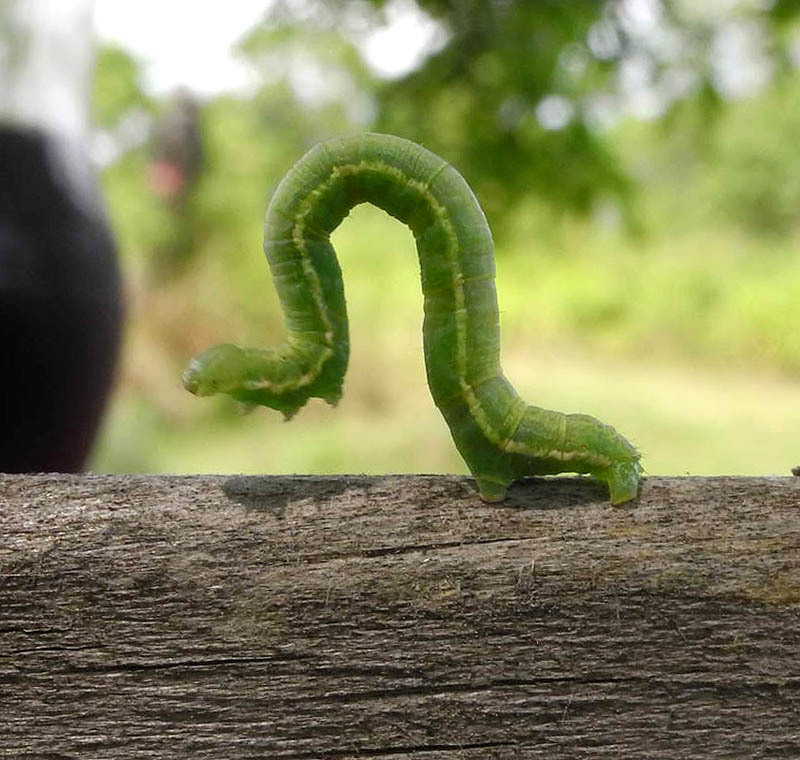 I had a very charming visitor during lunch yesterday, who kept me entertained with its amusing wanderings back and forth across the picnic table. 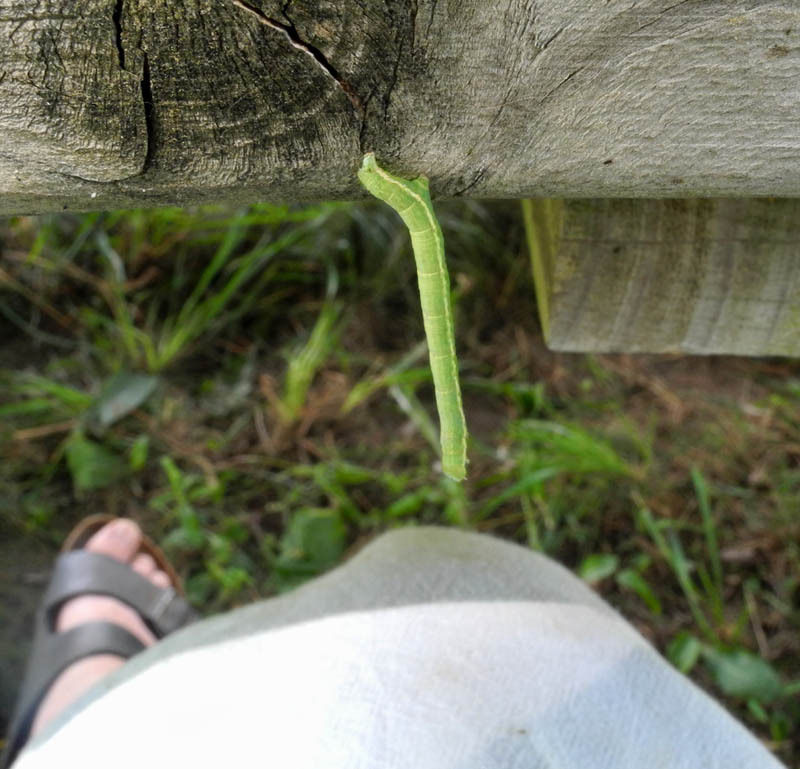 It was a small, 1 1/2 inch long, green inchworm, which I learned are named not after their size but after their means of locomotion. If you look closely at the photo (you can click it to enlarge it, as with all the photos on this blog) you'll see that it has legs only at front and back, with none of the center legs of an ordinary caterpillar; this causes it to make expressive loops in moving forward. The front end often waved in the air, looking for a place to touch down. 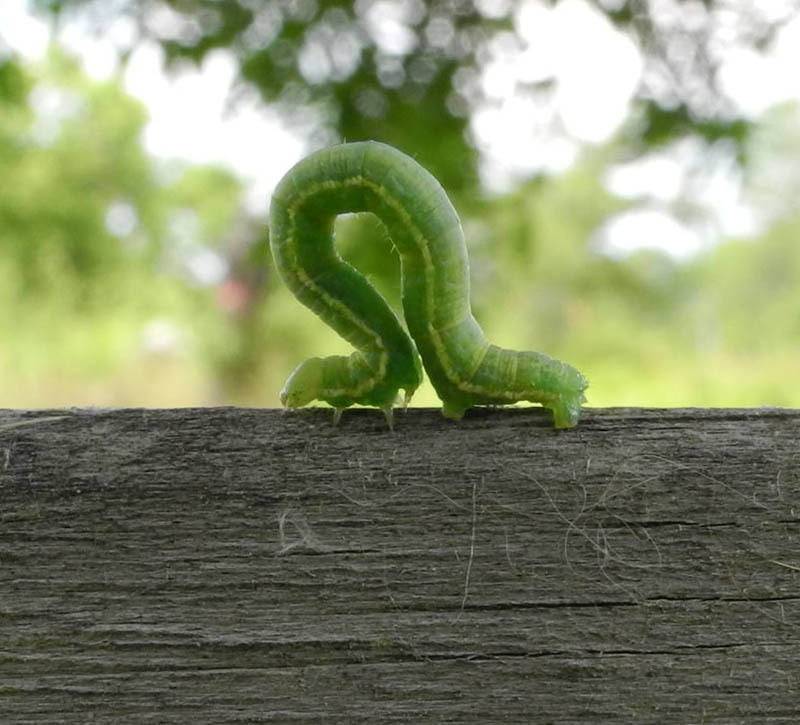 Here the inchworm hovers in mid air, like a rearing horse, but it's making a decision as to its direction. These caterpillars are the larvae of the Geometer moth of which there are 35,000(!) species. The name Geometridae comes from the Greek, meaning "earth-measurer", a reference to the way the caterpillars move: when the front legs move ahead, the insect then draws its back legs toward the front, making the loop, then the front legs move forward again. This looks just like a measuring motion, inch by inch. I lifted the inchworm on my bookmark a couple of times and placed it in different locations on the table, curious as to what it would do. It seemed to want to come back to see me each time, finally dangling from the lower edge of the table over my leg. Curiouser and curiouser...why did it do that? 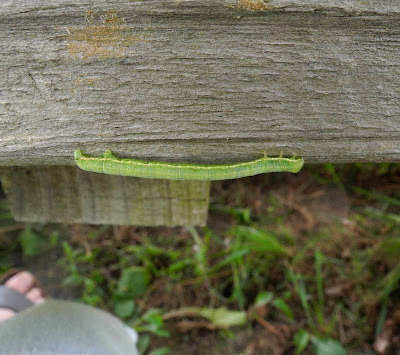 After a few minutes hanging there, it went on its way and disappeared under the table. 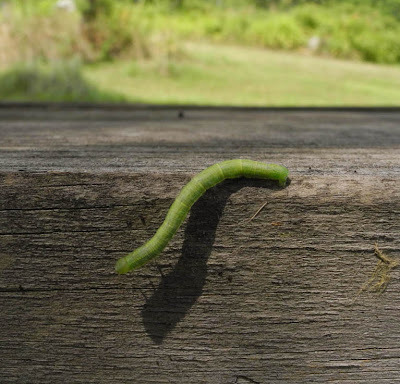 While I was watching the caterpillar cautiously move about, waving its front end in the air, searching, searching the way forward, I couldn't help but see it as a metaphor for our human lives; not our impulsive acts, but our more thoughtful moments, as we ponder, take a step, and another, test the winds, change direction slowly, move ahead little by little, but steadily. Happy Birthday, US of A!